Often translated as “Loyalty and Enmity,” the little-known Islamic doctrine of wala’ wa bara’ commands Muslims never to befriend or be loyal to non-Muslims, while being clean of, disavowing and ultimately hating them. During a question-and-answer session at an Islamic conference, the full extent of this divisive doctrine was given full expression (see video; also posted below). 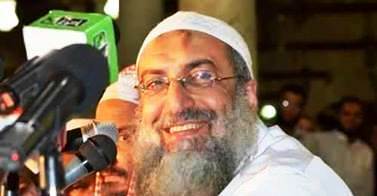 Popular preacher Dr. Yassir Burhami, the vice president of the Salafi party in Egypt, explained how Loyalty and Enmity must be upheld at all times—even with a Muslim’s wife, if she happens to be a non-Muslim member of the “People of the Book,” (Christians and Jews, whom Muslim males are permitted to marry from; conversely, male Christians and Jews are strictly banned from marrying Muslim females). Where’s the objection? Do all men love their wives? How many married couples live together despite disagreements and problems? Huh? That being the case, he [Muslim husband] may love the way she [non-Muslim woman] looks, or love the way she raises the children, or love that she has money. This is why he’s discouraged from marrying among the People of the Book—because she has no [real] religion. He is ordered to make her hate her religion while continuing marriage/sexual relations with her. This is a very standard matter…. Of course he should tell her that he hates her religion. He must show her that he hates her because of her religion, and because she is an infidel. But if possible, treat her well—perhaps that will cause her to convert to Islam. He should invite her to Islam and call her to Allah. In fact, let me tell you: whoever rapes a woman, does he necessarily love her? Or is he just sleeping with her? He’s sleeping with her for her body’s sake only, and he does not love her in reality, because if he loved her, he wouldn’t have hurt her. Therefore it is possible to have sexual relations [between a Muslim man and a Christian or Jewish woman] without love. This is possible, but as we said, he is commanded to hate her. Otherwise what do you do with the undisputed texts [of the Koran], such as “Thou wilt not find any people who believe in Allah and the Last Day, loving those who resist Allah and His Messenger, even though they were their fathers or their sons, or their brothers, or their kindred… “O ye who believe! take not the Jews and the Christians for your friends and protectors…” [Koran 58:22 and 5:51, Yusuf Ali translation]. What do you do with such a verse? What do you do will all these verses? This is the crux of the problem between so-called Islamists and so-called moderates: Islamic scriptures—like “all these verses” quoted by Burhami—often side with the “radical” (and intolerant, and hostile, and violent, and supremacist) worldview of the Islamists, leaving the moderates without much of a leg to stand on in the realm of Islamic exegesis. When he [Muslim husband] comes home, he should not be the first to greet her. He may greet his children [because they are Muslim] or he can offer a general greeting if any other Muslims are present, meaning them by it [but allowing her to think it’s for her]. These are mainstream commands… She has to begin with greeting him, and then he may respond. If this is how Islam expects the Muslim to treat his non-Muslim wife, simply because she is an “infidel,” how must it expect him to feel about non-Muslim strangers—like the majority of you reading this? Not that you’d know it, thanks to another of Islam’s complementary teachings: taqiyya.